• The canoe shed, used at the time by customers and guides as a maintenance workshop and where several vintage canoes are now exposed. The salmon basin, where you can see the Atlantic salmon, king of the rivers, in a reconstituted enclosure. 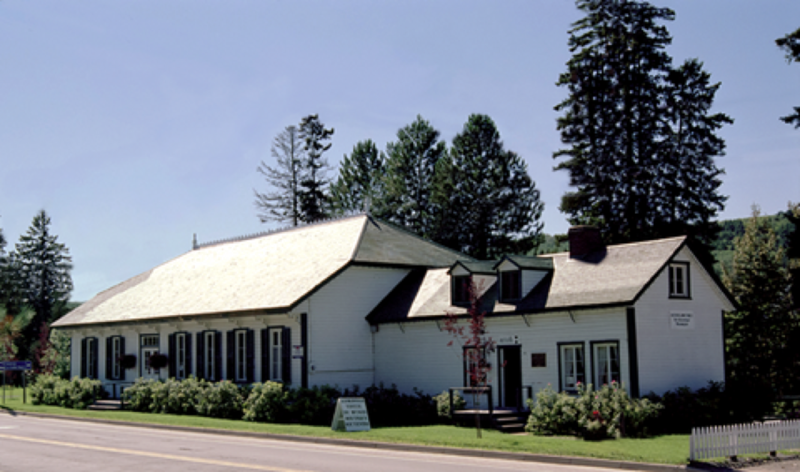 The main pavilion was built at the beginning of the 20th century, at the time of the Restigouche Salmon Club or the Matamajaw Salmon Club according to certain information. On the other hand, it is highly possible that it was Lord Mount Stephen who built this important building. The interior decorative style and architecture are reminiscent of his Montreal home. Moreover, it is an important witness to the outbreak, in Quebec, after 1870, of private fishing clubs, mostly frequented by an English-speaking elite. The building was used to house the Matamajaw Salmon Club’s clientele. There were several bedrooms, a living room and a dining room. The additional lodgings, built later, were used to house club employees, prepare meals and perform other daily tasks. The interior of the building reflects the great wealth typical of the time. The ceilings are high, the rooms are large, the decoration is neat. The use of wood makes the interior very warm. In addition, this building demonstrates the division between social classes at that time. There is an opulent part and a modest part in the style and use of the materials. This building is now part of the museum’s permanent exhibition. This tour will take you into the rich history of the site, the era of the Matamajaw Salmon Club. You will live the experience of being a member of this select fishing club. In addition, experience the frenzy of the fisherman and his passion for catching salmo salar. It is the oldest building on the Matamajaw Heritage Site. It was built between 1868 and 1871 by David Riley. Following the purchase of his properties, Lord Mount Stephen uses them as a place to stay. It is only after the construction of the central pavilion that it becomes the house of the guardian of the club. The Ice Box is part of a group of secondary buildings that were frequently found in private fishing clubs. Its heritage value then lies in its use. Each spring, at the end of March, employees filled the snowpack with ice and granular snow in the building’s snow compartment. It was used as a warehouse to keep salmon caught by club members during the summer season. The snow was kept until late in the fall. The heritage value also lies in its architecture. Like the other buildings in the complex, it comes from the American vernacular style, is covered with horizontal wooden planks, surmounted by a green roof and has retained it`s excellent state of authenticity. The heritage value of this building is, finally, based on its history. It was built in the late 19th century for the Restigouche Salmon Club. This building is now part of the museum’s permanent exhibition. You will discover during this tour, how it was used by club staff and how salmon was prepared inside the building for members. This shed served as a warehouse and workshop for the maintenance and repair of canoes used by the Matamajaw Salmon Club clientele and guides. The indian’s cabin was likely constructed at the beginning of the 1890’s, this building served as lodging for the Restigouche Native Americans that were employed as guides for the fishing club. This cabin is part of a secondary building complex, like those we would have frequently found in these private fishing clubs. The Matamajaw Fishing Heritage Site’s Salmon basin permits visitors to observe very closely Atlantic salmon in their reconstructed habitat enclosure. Allowing you an up close look at the king of our rivers.